Near the end of 2015, the What’s For Dinner? (WFD) WeChat outreach team (led by Jian Yi, Eva Song, Miao Jie, and Xiaoyan) conceived and developed a series of unique, beautifully designed guides for Chinese veg*ns—the Veg*n Pass and Veg*n Passsport (there is a vegan and vegetarian version of the pass and passport). These documents are the first of their kind in China, and while the target audience is the Chinese population, people around the world can make good use of the passes and passports, as they have text in many different languages. China today boasts the world’s second largest economy (and soon, according to estimates, will become the largest one) and the largest consumer of meat, dairy, and egg products. Consumption of animal products is skyrocketing as the economy grows and the living standards of Chinese upper/middle class citizens rise sharply. At the same time, vegan activism is gathering momentum as more and more Chinese people, especially the youth, are learning the negative impacts of animal agriculture for their health, the environment, and food security. What’s For Dinner?, a film produced by Brighter Green and directed by Jian Yi and his Chinese crew, is the only film made in China on the related topic. Since 2014, supported by Brighter Green, the WFD China team has started a national campaign that includes screenings, social media posts, talks and global dialogues, to further promote public awareness. Thanks to the outstanding dedication of the China team, WFD has become one of the most active and notable voices among the vegan community in China today. 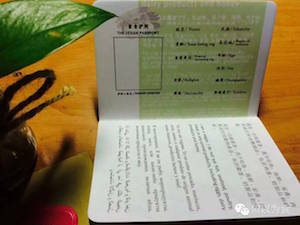 Based on the success and strategic analysis of the campaign as well as its observations of the needs in the community, the WFD China team has created a wonderful line-up of WFD veg*n passes/passports for all veg*ns in China in order to encourage them to be more assertive and outspoken about their food choices. WFD announced the initiative on its social media feed on World Vegan Day (Nov. 1, 2015) and received tremendous enthusiasm from the audience. Hundreds placed pre-orders and expressed great excitement like ‘Finally, there is something like this!’ and “Wow, we wonder why such a thing had not come out earlier! WFD has even received many inquiries from Chinese veg*ns living abroad for these products. WFD China has printed the first edition of these folding passes (credit card size) and passports and has begun to disseminate them around the country. These items are only available in China from the WFD Online Store, but we are working on a distribution plan to make them more available globally. 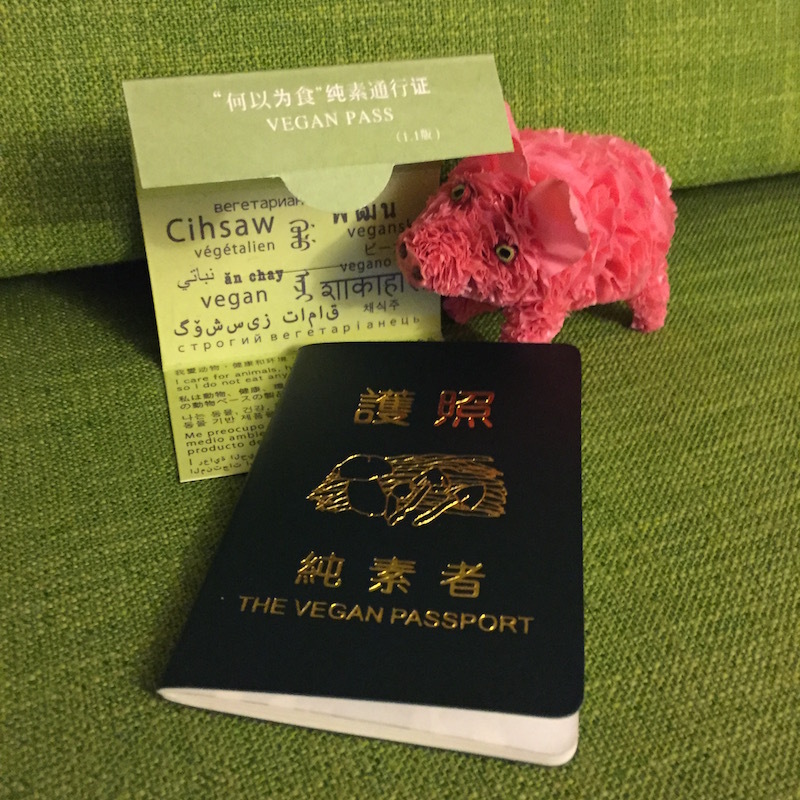 In fact, Mia MacDonald shared some copies of the vegan pass and passport at veg*n and vegan-friendly restaurants while in Italy for a food and environment strategy meeting in late January/early February 2016.